Sound source localization is an important feature in robot audition. This work proposes a sound source number and directions estimation method under a multisource reverberant environment. 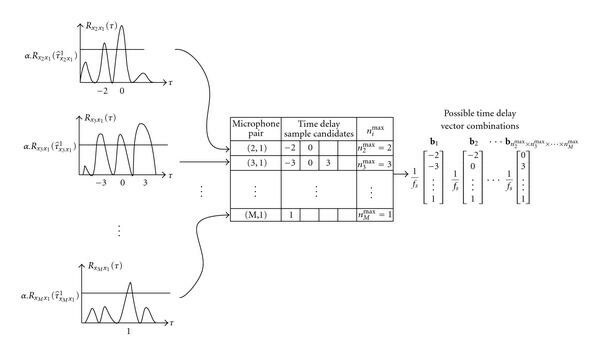 An eigenstructure-based generalized cross-correlation method is proposed to estimate time delay among microphones. A source is considered as a candidate if the corresponding time delay combination among microphones gives reasonable sound speed estimation. Under reverberation, some candidates might be spurious but their direction estimations are not consistent for consecutive data frames. Therefore, an adaptive K-means++ algorithm is proposed to cluster the accumulated results from the sound speed selection mechanism. Experimental results demonstrate the performance of the proposed algorithm in a real room. Sound source localization is one of the fundamental features of robot audition for human-robot interaction as well as recognition of the environment. The idea of using multiple microphones to localize sound sources has been developed for a long time. Among various kinds of sound localization methods, generalized cross correlation (GCC) [1–3] was used for robotic applications  but it is not robust under multiple sources environment. Improvements on the performance in the multiple sources and reverberant environment have also been discussed [5, 6]. 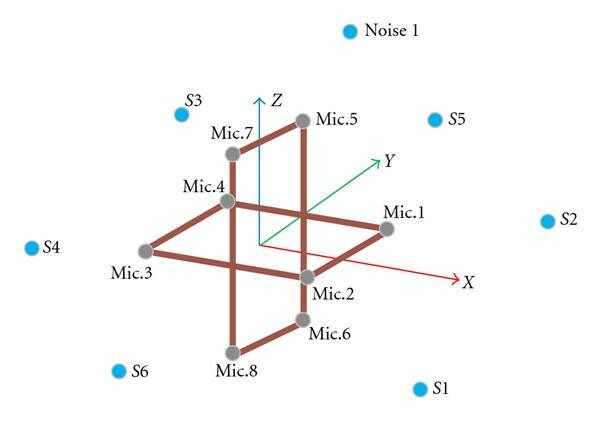 Another approach, proposed by Balan and Rosca , explores the eigenstructure of the correlation matrix of the microphone array by separating speech signals and noise signals into two orthogonal subspaces. The direction-of-arrival (DOA) is then estimated by projecting the manifold vectors onto the noise subspace. MUSIC [8, 9] combined with spatial smoothing  is one of the most popular methods for eliminating the coherence problem and it is also applied to the robot audition . Based on the geometrical relationship among time delay values, Walworth and Mahajan  proposed a linear equation formulation for the estimation of the three-dimensional (3D) position of a wave source. Later, Valin et al. gave a simple solution for the linear equation in  based on the far-field assumption and developed a novel weighting function method to estimate the time delay. In a real environment, the sound source may move. Valin et al. 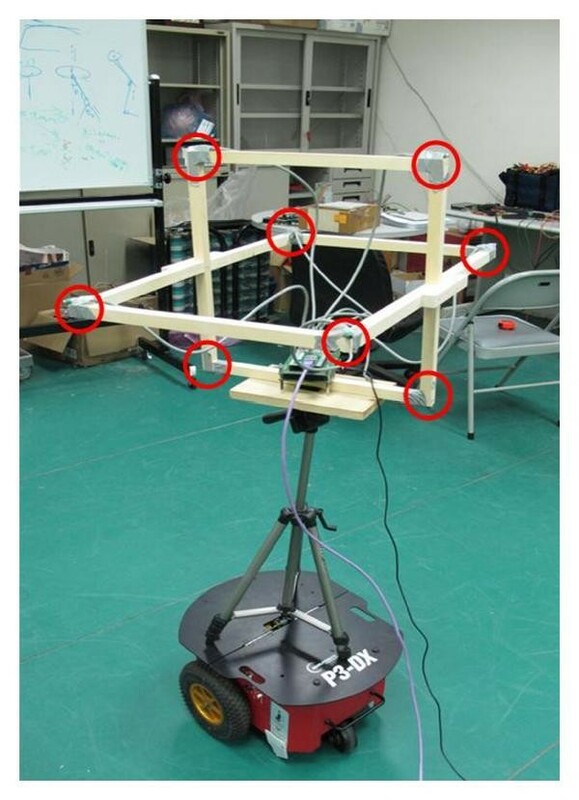 proposed a localization and tracking of simultaneous moving sound sources method using eight microphones and this method is based on a frequency domain implementation of a steered beamformer along with a particle filter-based tracking algorithm. In addition, Badali et al. investigated the accuracy of different time delay of arrival estimation audio localization implementations in the context of artificial audition for robotic systems. Yao et al. presented an efficient blind beamformer technique to estimate the time delays from the dominant source. This method estimated the relative time delay from the dominant eigenvector computed from the time-averaged sample correlation matrix. They have also formulated a source linear equation similar with  to estimate the source location and velocity via least square method. Statistical methods [17–19] have also been proposed to solve the DOA problem under complex environment. These methods yield superior performance than conventional DOA method especially when the sound source is not within line-of-sight. However, a training procedure is needed for these methods to obtain the pattern of sound wave arrival. This may not be realistic for the robot applications when the environment is unknown. The methods above assume that the sound source number is known. But this may not be a realistic assumption because the environment usually contains various kinds of sound sources. Several eigenvalue-based methods have been proposed [20, 21] to estimate the sound source number. However, the eigenvalue distribution is sensitive to noise and reverberation. The work in  used the support vector machine (SVM) to classify the distribution with respect to the sound source number. However, it still requires a training stage for a robust result and the binary classification is inadequate when the sound source number is larger than two. The objective of this work is to estimate the multiple fixed sound source directions without a priori information of the sound source number and the environment. This work utilizes the time delay information and microphone array geometry to estimate the sound source directions . A novel eigenstructure-based GCC (ES-GCC) method to estimate the time delay under a multi-source environment between two microphones is proposed. The theoretical proof of the ES-GCC method is given, and the experimental results show that it is robust in a noisy environment. As a result, the sound source direction and velocity can be obtained by solving the proposed linear equation model using the time delay information. Fundamentally, the sound source number should be known while estimating the sound source directions. Hence, the method which can estimate sound source number and directions simultaneously using the proposed adaptive -means++ is introduced and all the experiments are conducted in a real environment. This paper is organized as follows. In Section 2, we introduce the novel ES-GCC method for time delay estimation. With the time delay estimation, the sound source direction and speed estimation method is presented in Section 3, where the estimation error is also analyzed. In Section 4, we propose the sound speed selection mechanism and adaptive -means++ algorithm. Experimental results, presented in Section 5, demonstrate the performance of the proposed algorithm in a real environment. Section 6 concludes the paper. Also, achieves its maximum value of when (i.e., when the source is located along the line passing through the midpoint of and perpendicular to the segment connecting the i th and the first microphone). This also means that has the order of magnitude less than or equal to the magnitude of vector . Equation (26) can be derived by substituting (28) into (27). 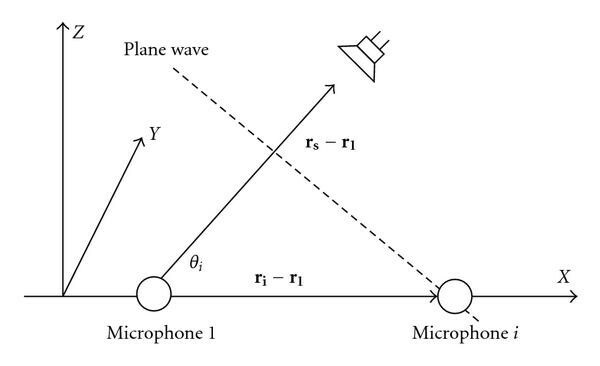 Geometry model of plane wave and two microphones. Without loss of generality, assume that . Since both and are nonnegative, (33) shows that if the far-field assumption is utilized (see (26)), the delay shall be decreased to match the real situation. However, when solving (26), there is no modification of the value . Therefore, one possibility to match the case of augmented delay is to decrease the speed of sound. Another possibility is to change the direction of the source vector . However, for an array spans the 3D space, the possibility of adjusting the source direction for all sensor pairs is small since the least square method is applied. For example, changing the direction may work for sensor pair (1,i) but has adverse effect on sensor pair (1, j) if and are perpendicular to each other. A simple simulation for estimation error is illustrated for the microphone locations depicted in Figure 7. We assume that there is no time delay estimation error and the sound velocity is 34300 cm/sec. The sound source location is moved on the direction vector (0.3256, 0.9455, 0) to make sure that . The estimated sound source direction and velocity are obtained by using (31) and (32). 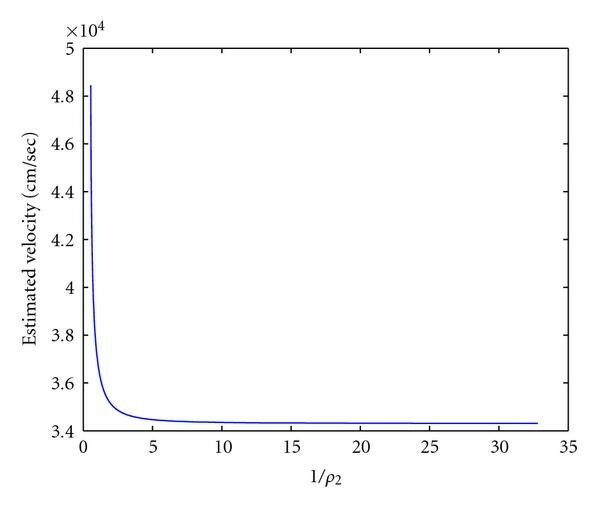 Figure 2 shows the relation between direction estimation error and the factor . The direction estimation error is defined as the difference between real angel and estimated angle. As it can be seen, the estimation error becomes smaller and converges to a small value when is increased. In particular, the estimation error would not change dramatically when is larger than 5 ( is larger than five times of ). 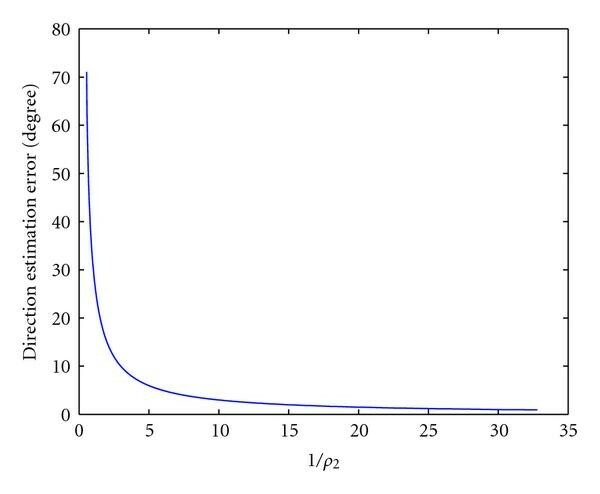 Figure 3 shows the relation between estimated velocity and . The estimated velocity converges to 34300 when is increased and this is consistent with the analysis at the beginning of this section. Direction estimation error versus . This paper assumes that the distance from source to the array is much larger than the array aperture, and (29) is used to solve the sound source direction estimation problem. If the number of sound sources is known, the sound source directions can be estimated by putting time delay vector of corresponding sound source into (32). However, if the sound source number is unknown, the sound source directions estimation will become more complicated since there are several combinations to form the timed delay vectors. This section describes how to estimate the sound sources number and directions simultaneously using the proposed method in Sections 2 and 3.2. A two-step algorithm is proposed to estimate the source number. First, the combinations of delays are filtered by the estimated sound velocity which does not fall within a reasonable range of the true one. But in a reverberant environment, it is still possible to have a phantom source that results in reasonable sound speed estimation. This paper assumes that the power level of phantom source is much weaker than that of the true source. Therefore, only a true source can exhibit a consistent estimation of direction on consecutive frames of signals because the weighting function of ES-GCC also has certain robustness to reverberation. The second step of source number estimation is to cluster the accumulated results from the first step using clustering technique and the reverberation can be considered as the outlier for the clustering technique. The well-known clustering method, -means, is sensitive to initial conditions and is not robust to outliers. In addition, the cluster number should be known in advance for -means which cannot be met in our scenario since we have no information of the sound source number. To improve the problems of robustness and cluster number, this paper proposes the adaptive -means++ method based on the -means  and -means++  methods for clustering. The -means++ method is a way of initializing -means by choosing random starting centers with very specific probabilities. It then runs the normal -means algorithm afterwards. Because the seeding technique of -means++ method can improve both the speed and accuracy of the -means method , this paper employs the seeding technique of -means++ method to seed the initial centers for the proposed adaptive -means++ method. where is the estimated time delay from the sound source to the i th microphone and is the estimated time delay sample between the i th microphone and the first microphone. The next issue is how to choose correct combinations and determine the sound source number. Illustration of the procedure of forming possible time delay vector combinations. To access whether the delay combination is likely to be a correct one, this work proposes a novel concept of evaluating if the corresponding sound velocity estimation of (31) is within an acceptable range. In other words, each possible combination is plugged into (31) to compute the sound velocity. It is considered as a correct combination if the following criterion is satisfied. where and are azimuth and elevation angle for the sound source, respectively. where is the expectation operation and is a specified threshold. Equation (40) is used to check the variance of each cluster when the -means algorithm converges. If one of the variance of each cluster is not less than , the value of is increased by one. Then the other initial center is found by using the seeding technique of -means++  defined in (41) and the -means algorithm is computed again. where represents the distance between and the nearest center we have already chosen; is the real number chosen uniformly at random between 0 and . For the adaptive -means++ algorithm, the inputs are and the outputs are and . The flowchart of the adaptive -means++ algorithm for estimating the sound sources number and directions is shown in Figure 5 and is summarized as follows. 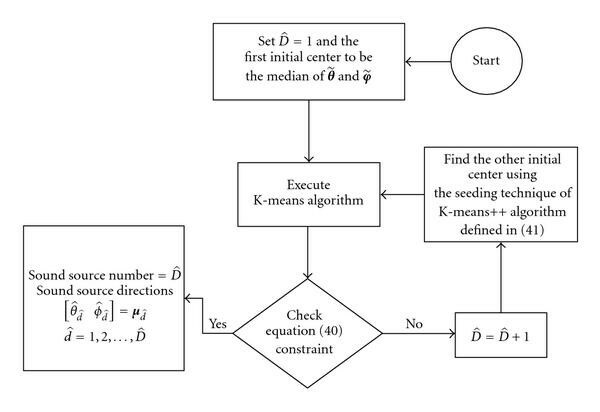 The flowchart of adaptive K-means++ algorithm. Step 1. Calculate ES-GCC function . Pick the peaks satisfying (34) from for each microphone pair and list all the possible time delay vector combinations . Step 2. Select time delay vector from using (36) and estimate the corresponding sound source direction using (37). Step 3. Repeat Steps 1 to 2 times and accumulate the results. Before each repeat, shift the start frame of Step 1 with frames. Step 4. Cluster the accumulated results using adaptive -means++ algorithm and the final cluster number and centers are sound source number and directions, respectively. The dehumidifier which is 430 cm from the first microphone is turned on during this experiment (Noise 1 in Figure 7). The parameters of , , and are determined by our experience and are empirically set to be 0.7, 5000, and 23. The accumulation parameters and are set to be 20 and 25. Digital microphone array mounted on the robot. Arrangement of microphone array and sound sources. where is the total number of estimation, is the i th time delay estimation, and is the i th correct delay sample with a integer. Figure 8 shows the RMSE results as a function of SNR for three different TDE algorithms. The total number of estimation is 294. As seen from Figure 8, the GCC-PHAT yields better TDE performance than GCC-ML at higher SNR. This is because the experimental environment is reverberant and the GCC-ML suffers significant performance degradation under reverberation. TDE RMSE results versus SNR. Comparing to GCC-ML, the GCC-PHAT has robustness with respect to reverberation. 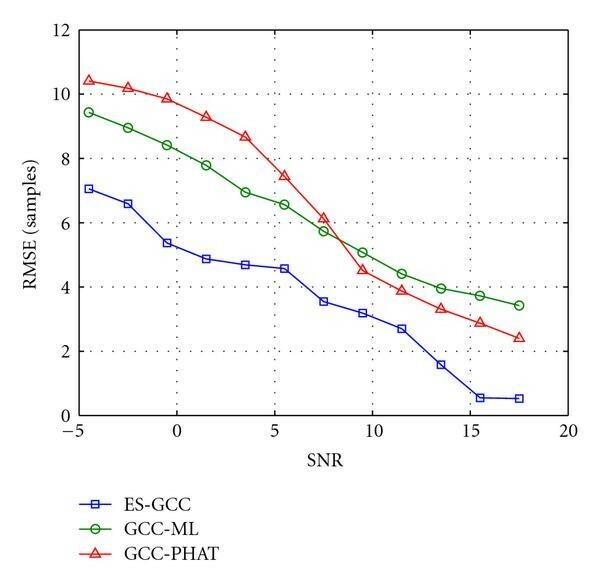 However, the GCC-PHAT method neglects the noise effect, and hence, it begins to exhibit dramatic performance degradation as the SNR is decreased. Unlike GCC-PHAT, GCC-ML does not exhibit this phenomenon since it has a priori knowledge about the noise power spectra which can help estimator to cope with distortion. The ES-GCC achieves the best performance, because the ES-GCC method does not focus on the weighting function process of GCC-based method and it directly takes the principal component vector as the microphone received signal for further signal processing. The appendix provides the proof that the principal component vector can be considered as the approximation of speech-only signal and this is the reason why the ES-GCC method is robust to the SNR. The wideband incoherent MUSIC algorithm  with arithmetic mean is adopted to compare with the proposed algorithm. Ten major frequencies, ranging from 0.1 KHz to 3.4 KHz, were adopted for the MUSIC algorithm. Outliers were removed from the estimated angles by utilizing the method provided in . In addition, the sound source number should be known first for MUSIC algorithm to construct the noise projection matrix. Therefore, the eigenvalues-based information theoretic criteria (ITC) method  is employed to estimate the sound source number. The sound source number estimation RMSE result is shown in Figure 9 and the averaged SNR is 17.23 dB. The RMSE is defined similar to (44) with a different measurement unit. The sound source positions are chosen randomly from six positions shown in Figure 7 and the number of estimation for each condition is 100. The noise 1 in Figure 7 is active in this experiment. 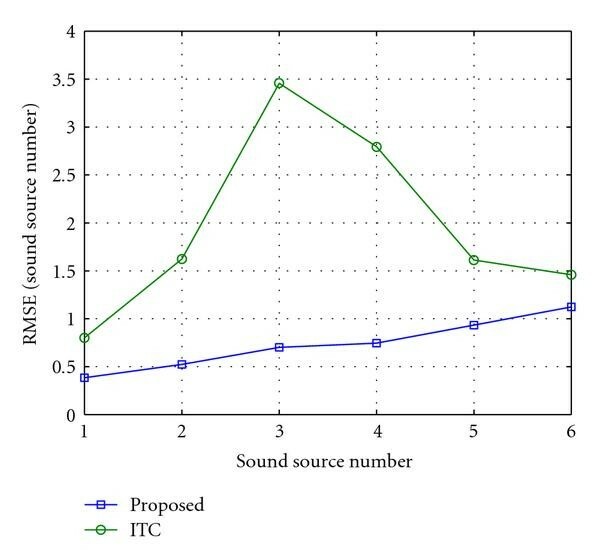 As can be seen, the proposed sound source number estimation method yields better performance than the ITC method. One of the reasons is that the eigenvalue distribution is sensitive to reverberation and background noise. When the sound source number is larger than or equal to three, the ITC method often estimates a higher sound source number (5, 6, or 7). Sound source number estimation result. The sound source direction estimation RMSE result is shown in Figure 10. For fair comparison, the RMSE is calculated when the sound source number estimation is correct. 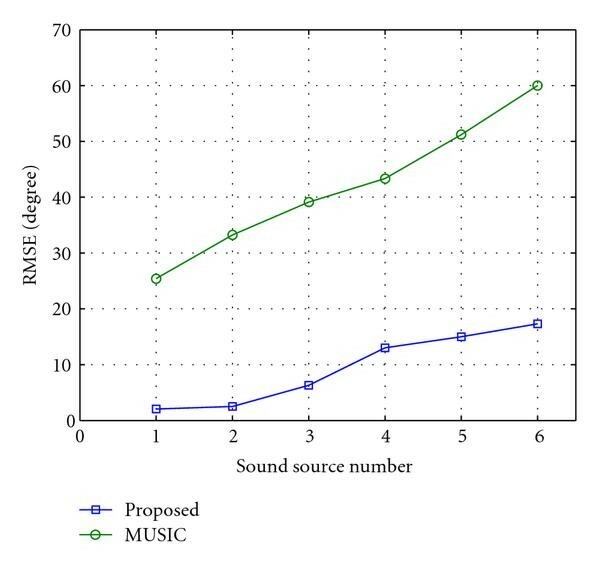 Figure 10 shows that the MUSIC algorithm becomes worse as the sound source number is increased since the MUSIC algorithm is sensitive to coherent signal especially when the environment is multiple sound sources and reverberant. The proposed method uses sound velocity as the criterion for time delay candidate selection and the adaptive -means++ is employed at final stage to cluster the sound source number and directions. The other advantage of the proposed method is that there is no a priori knowledge for sound source number and we use the adaptive K-means++ to estimate the sound source number and directions simultaneously. An incorrect sound source number for MUSIC algorithm would cause an even worse performance than Figure 10. In addition, in multiple sound sources case, if we take all time delay combinations to estimate the sound source direction without sound velocity selection mechanism, the result becomes very poor. We find that the wrong combination of time delay vector will cause the estimated sound speed to range between 9000 and 15000 or more than 50000. Sound source directions estimation result. This work explains a sound source number and directions estimation algorithm. The multiple source time delay vector combination problem can be solved by the proposed reasonable sound velocity-based method. By accumulating the estimated sound source angle, the sound source number and directions can be obtained by the proposed adaptive -means++ algorithm. The proposed algorithm is evaluated in a real environment and the experimental results show that the proposed algorithm is robust to real environment and can provide reliable information for further robot audition research. The accuracy of adaptive -means++ may be influenced by outliers if there is no outlier rejection. Therefore, the outlier rejection method may be incorporated to improve the performance. Moreover, the parameters of , , and are determined by our experience. In our experience, the parameter is not as sensitive as and to influence the results. The sensitivity of these parameters to influence the results is the other issue and this is left as a further research topic. As can be seen from (A.23), the received speech signal is only the scalar version of the corresponding eigenvector for the maximum eigenvalue. Therefore, we take this eigenvector as the microphone received signal for time delay estimation. Equation (A.23) is obtained by using the maximum eigenvalue to solve (A.17). If other eigenvalues can also neglect the variance as , they can also have the speech signal approximation property. It represents that if the sound source number is one, is the only eigenvector which can represent the received speech signal since is the only dominant eigenvalue and the other eigenvectors ( , contain the noise information. If the sound source number is larger than one, the other eigenvectors ( , may contain some speech signal information. However, the conversational speech sources are asynchronous and contain many short pauses. Some speech sources information may not be represented by in this frame but may be represented in the next frame. Based on this concept, this paper uses eigenvector for time delay estimation since it can represent received speech signal most, accumulates the estimated DOA results, and uses adaptive -means++ for clustering the accumulated results. The algorithms that use the vectors that lie in the signal subspace are based on a principal components analysis (PCA) of the autocorrelation matrix and are referred to as signal subspace method . This paper further justifies the use of since it can represent the speech signal better than the other eigenvectors from (A.17) and (A.23).